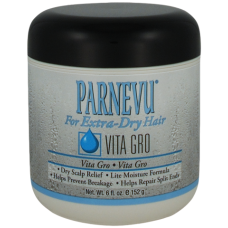 PARNEVU Extra Dry Vita Gro is a light, therapeutic formula that has the ability to relive dandruff, itchy scalp, and repair split ends while providing sheen. 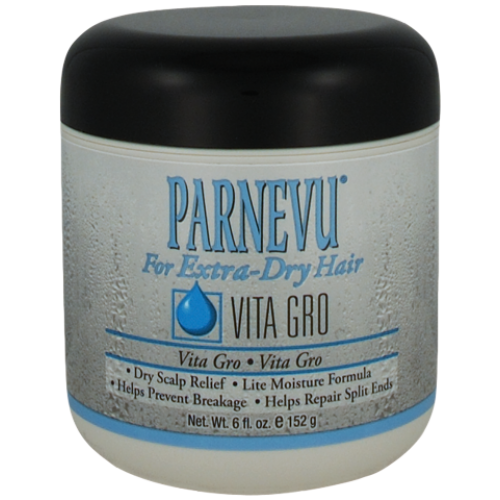 It combines sage, sulfur, camphor, and coconut oil to create a blend that provides the roots with the necessary oils and nutrients to promote healthy hair. Directions for Use: Apply at least every other day for best results. Hair Treatment - Rub hands together and massage into hair. Style as usual. Scalp Treatment - Part hair into sections and apply to scalp with firm wide strokes. Massage into the scalp with fingers. Brush or style as usual. Size: 6 fl. oz. / 152 g.
INGREDIENTS: Petrolatum, Mineral Oil (Paraffinum Liquidum, Huile minerale), Simmodsia Chinensis (Jojoba) Seed Oil, Triticum Vulgare (Wheat) Germ Oil, Cocos Nucifera (Coconut) Oil, Menthol, Camphor, Sulfur, Sodium PCA, Sodium Lactate, Arginine, Aspartic Acid, PCA, Glycine, Alanine, Serine, Valine, Proline, Threonine, Isoleucine, Histidine, Phenylalanine, Salvia Officinalis (Sage) Leaf Extract, C12-15 Alkyl Benzoate, Fragrance (Parfum), Tocopheryl Acetate, Retinyl Palmitate, Cholecalciferol, Zea Mays (Corn) Oil, Green 6 (CI 61565), Yellow 11 (CI 47000).